Sitting Can Kill You—But What about Standing or Lying Down (on the Job)? Is it possible that, for the sake of our health, we should literally lie down on the job? If you can’t or don’t move around much at work, which is more likely to jeopardize your health or even kill you: sitting, standing or lying down? The answer really matters if you, like me, exclusively telecommute or are thinking about doing so. Given a Cisco Corporation report that by 2016, 43% of all U.S. workers will be “teleworking” at least part-time, the notion and relevance of “lying down on the job” seems less remote as the workplace physically becomes increasingly so. The problem is, it is really hard to find any research into the effects of prolonged reclining. Various keyword searches at Pubmed.com, through Google, etc., returned only finger-countable results, with narrow focuses and implications. If we must work in a sedentary mode, which is best for our health—sitting, standing or some variation on lying down? In past communications with me, Dr. Marc Hamilton, Pennington Biomedical Research Center, Baton Rouge, Louisiana and Dr. James Levine, Minnesota Mayo Clinic, profiled in a New York Times Magazine April 2011 article by James Vlahos, “Is Sitting a Lethal Activity?” and in my 2012 recruiter.com article “The Future of Teleworking: You Can Bed on It”, discussed the dangers of sedentary postures, but with an emphasis on sitting, not on lying down. In their research, they clearly established the importance of intermittent non-exercise movements throughout the day as an offset to the deleterious effects of prolonged sitting, the main focus of their research. Their conclusion: If you are spending eight non-stop hours a day sitting, it will make little or no difference what you do the rest of the time, e.g., washing dishes, getting the mail, standing by the water cooler, or training for an Iron Man marathon—your health will suffer. As reported in my teleworking article, if you think that “working out” can offset the damage, you are mistaken. Both Hamilton and Levine point out that metabolic and genetic pathways, such as those used by “good cholesterol” HDL deactivated by sedentary postures and work styles that lead to cardiovascular and other diseases, such as diabetes, apparently are not the same as those activated by exercise. This means that instead of sitting and running being “opposites” on a single, reversible metabolic continuum, their interrelationship is more like that between smoking and running, since no amount of running will offset the cancer risks of smoking—except to the extent that such exercise reduces the amount of time spent in sedentary mode. Yes, the damage is shockingly irrespective of how much intense exercise one gets otherwise, given no corresponding offsetting reduction in couch-potato or office-potato time. The good news is that incorporating into one’s daily routine more of what Dr. Levine has called “NEAT” (Non-Exercise Activity Thermogenesis) movements, such as getting up to get a coffee or to use the fax machine—movements that actually comprise the bulk of our daily physical activity, can partially offset the harmful effects of a sedentary life or job. But given that Drs. Hamilton and Levine interpret “sedentary” as “not standing and not ambulatory”, it is still worth asking how lying down for prolonged periods stacks up, from the health standpoint, against motionless sitting; against standing without major movement or full-body muscle contractions—such as yoga or isometric exercises; and against more active standing, with either major muscle movements like twisting, bending or stretching. Potentially complicating the issues is the fact that one can be stationary—not moving from a given place, yet in motion, namely, by moving within it. That’s like the difference between a planet’s revolution around the Sun and that planet’s rotation around its own axis. You, like the Earth and ice skater, could be spinning around your own axis, while, unlike the earth, not changing your position. Alternatively, you could be utterly sedentary, yet holding a very physically demanding yoga pose. Would prolonged daily yoga be as bad as being slumped over an office desk for the day? So, theoretically, you could be quite stationary, but still “exercising”, e.g., while maintaining a Lotus pose, a ballet arabesque or karate horse stance. Hence, from an energy-expenditure standpoint, “sedentary” and “stationary” must be distinguished from each other. 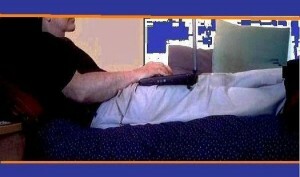 The research suggests that, indeed, they must be distinguished from “inactive”, for the latter, a concept at the core of inactivity physiology studies, is the decisive determinant of the risks and rewards associated with your “postural allotments”—how and how long you sit, stand, lie down, recline, move or otherwise deploy your limbs and other body parts. In particular, any temptation to equate “sedentary”, “inactive” and “stationary” must be resisted and overcome. The differences must be noted, especially to the extent that any presumed equivalence obscures the fact that there can be notable differences in the health outcomes for those who are totally motionless while stationary and those who burn calories in subtle but frequent NEAT movements and exertions. These include exertions such as twisting, stooping, bending or otherwise contracting skeletal muscles while standing in one place, or isometrically/isotonically/isokinetically using muscles while lying down. There’s a very important additional question: But what if the stresses and strains of sitting are also emotional-psychological and variable from person to person? Physically, that is clearly so, as anyone with a herniated disc will tell you. Involuntariness and Different Strokes [Prevention] for Different Folks? One extremely important caveat and theoretical possibility in investigating the impact of posture on health is that the optimal work posture may not be the same for everyone and that being forced to sit, stand, lie down or even kneel may have varying psychological and health consequences for different people. I have no medical background, but it seems fair to ask whether or not the physical, psychological and even the social stress of being forced to adopt a specific work posture, e.g., to sit at a desk all day, may adversely impact mental and physical health over the long run —for example, by elevating and sustaining stress-hormone levels, e.g., of cortisol, which is implicated in cardiovascular disease when chronically elevated. Likewise, differences in body size and weight may translate into different stress levels for different people, e.g., because of differences in degree of lower body compression as torso weight varies. I believe that is why, unlike much smaller people, I could never comfortably kneel in the end-of-class meditative “seiza” [which sounds like "seizure"] posture at karate classes in Japan: As compared with a karate-kid’s size, load and anatomy, my longer femur plus heavy torso meant more strain on my knee ligaments and agonizing discomfort compounded by the stress of it’s having been mandatory. What comes to mind in this connection is the well-confirmed connection, e.g., as identified in the research of Dr. Robert Karasek, between cardiovascular disease, work load and lack of job “latitude”—choice and freedom in doing one’s job. Excess load and/or insufficient latitude spell cardiovascular trouble. Since being forced to sit or stand by infrastructure, circumstances or company rules means diminished latitude, is it not possible that involuntariness, as a risk factor, contributes to heightened health risks? From this standpoint, it may be that an environment, job or boss that requires staff to permanently recline or stand might be just as psychologically stressful and therefore, over the long run, as deleterious to health as requiring them to sit. Suppose the assigned posture is uncomfortable in any sense—including socially and psychologically, as well as physically, e.g., because it is perceived as coerced, demeaning or inappropriate, and especially if the denial of choice, the involuntariness of the posture, is experienced as stressful. Since workplace involuntariness is tantamount to a lack of latitude, shouldn’t forced posture be explored as a possible key variable in the development of posture-related health risks? In this connection, it must be asked whether being “forced” to work in any given posture is less likely to be stressful if it is one’s preferred posture. I know people who actually like sitting, dislike reclining, e.g., because it makes them sleepy or unfocused, and who therefore will never know the stress I feel in being forced to sit—which, because of the physical discomfort in my case, makes the involuntariness all the more resented and stressful. As for experimental evidence of the effects of a lack of postural latitude, in one of our conversations, Dr. Hamilton mentioned that in at least one animal-restraint study, the measurable stress effects of involuntariness were localized and limited to the muscles physically restrained—without suggesting any inference to complex psychological, physiological or social human responses to workplace postural constraints and lack of choice. However, if involuntariness in “postural allocation” is a human stress factor, the implication for inactivity studies is that the cardiovascular damage may have psychological as well as physiological factors that need to be teased from or ruled out in the research. What we find naturally and personally comfortable may provide a crucial clue: If Mother Nature designed us to sit at a desk eight hours a day, she wouldn’t have punished us with lower backaches, stiff necks, tight shoulders, leg cramps, fidgeting, uncontrollable urges to take breaks, varicose veins, pronounced distractibility and—perhaps worst of all—heightened risk of cardiovascular disease and premature death. That’s probably why I hate sitting upright and immobilized—loathe it and always have, because it is, for me, so unnatural and uncomfortable. My credo and style: If I’m vertical, I’m moving. Otherwise, I’m comfortably horizontal. Besides, I hated sitting even as a preteen and teenager and, accordingly, lived on the floor. Why? Too much muscular tension, stress on my spine, dangling weight of arms, shoulder fatigue, leg discomfort. When I was a college freshman, I couldn’t sit and concentrate at my dorm desk or library table for more than an hour—per day, sometimes; when I eventually switched to a reclining position, I was able to easily study about 10 hours a day, with a gratifyingly improved GPA as an obvious result. No gravitationally-induced pooling of blood in legs. Isn’t this why it feels soooo comfortable? What About Standing All Day? Standing at a desk, as Bush Secretary of Defense, Donald Rumsfeld did in the Pentagon, is an option, and one that has attracted a lot of media attention—but, for most of us, it’s probably not a comfortable alternative. Besides, doesn’t standing (or sitting) increase your risk of backache, varicose veins, phlebitis or “deep vascular thrombosis”? I’m just asking, and not rhetorically. Some of those who’ve “been there, done that” give the “standing desk” a blisteringly negative review, rather than a standing ovation, while medical assessments are mixed. “Standing desks, treadmill desks, under-the-desk bicycles, and so on are largely unproven as a viable solution for public health. The genuine public health solution must be able to able to replace a large amount of the 10 hours per day of sedentary time in tens of millions of people of all types, so that we shift the balance from a predominantly inactive day back to a predominantly active day needed for optimal health. If lying down on the job in the office is not an option for you, ask yourself whether it should replace sitting when working or relaxing at home. 1. Various studies just lump sitting and reclining together, as “non-ambulatory and non-standing” postures. 2. Studies about the impact of prolonged recumbency are likely to involve bed-ridden invalids, which complicates the attempt to determine the effects of lying down on health—especially for extrapolation to a healthy population. 3. Most inactivity studies and reports focus on sitting, pretty much to the total exclusion of recumbent, reclining, “decubitus”, semi-recumbent, supine and other postures that all, in some way, involve being more horizontal than vertical. Some other studies that mention “lying down” in the same critical breath as “sitting” nonetheless present data almost exclusively about sitting. Despite the definition of sedentary as “sitting or lying down”, in the data reported therein, there is absolutely no mention of “lying down”. The result is that lying down is tarred with the same brush as sitting, but without any citation of the evidence that would justify that. So What Are We to Think and Do? Despite the fact that reclining is for me an infinitely more comfortable, relaxing, stress-free and sustainable posture, am I to conclude that it is just as risky or riskier to luxuriate in a sea of pillows propping up neck and shoulders, while one’s legs beneath a safe non-wireless-connected laptop are fully and comfortably extended and cushioned by pillows? Given the stakes and the strength of the accumulating evidence that “sedentary” work and life styles put our health at risk, a closer examination and refinement of the issue may be warranted before all stationary work and relaxation, including and especially reclining or semi-reclining, are painted funereal black with the same research brush. After all, don’t you want to know whether lying down on the job or around the house is just another fast track to getting laid out? Note: Always consult your healthcare provider or other experts for advice and diagnosis regarding any health issue or decisions, including your postural allocations and other lifestyle choices.